Personal Antispam also looks for specific types of headers and layout used in HTML messages, which are most often used for spam, allowing the program to not only search for content, but also for the subtle ways that spammers craft their messages. Spam techniques are constantly changing, and Personal Antispam offers regular updates to its filters to fight new types of spam as they appear, and to update its database of spam URLs. For information on installing and serializing Personal Antispam, see the Intego Getting Started Manual. Personal Antispam uses Intego NetUpdate, which is installed with the program, to provide updates to the program's filters, as well as to the program itself. For information on using NetUpdate, see the Intego Getting Started Manual. To get information about your copy of Personal Antispam, choose Personal Antispam > About Personal Antispam. It gives information about Personal Antispam, such as the version number, your support number (a number you will need for technical support), and a clickable link to send e-mail to Intego's support department. Click Continue to begin configuring Personal Antispam. You can click Go Back at any time to return to previous screens. 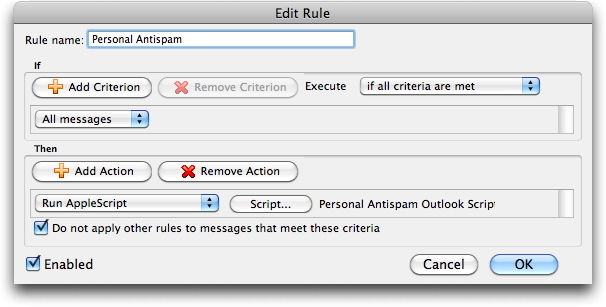 Note that Personal Antispam will not filter spam unless you configure it to work with your e-mail program, either Apple Mail or Microsoft Entourage or Outlook. It will also not filter spam with other e-mail programs. This screen explains what lexical filtering is, and tells you how Personal Antispam uses this technique to filter your e-mail. As the text in the above screen explains, Personal Antispam's filters become more efficient by learning from the actual e-mail that your receive. You must teach it to recognize both spam and legitimate e-mail for it to be most effective. 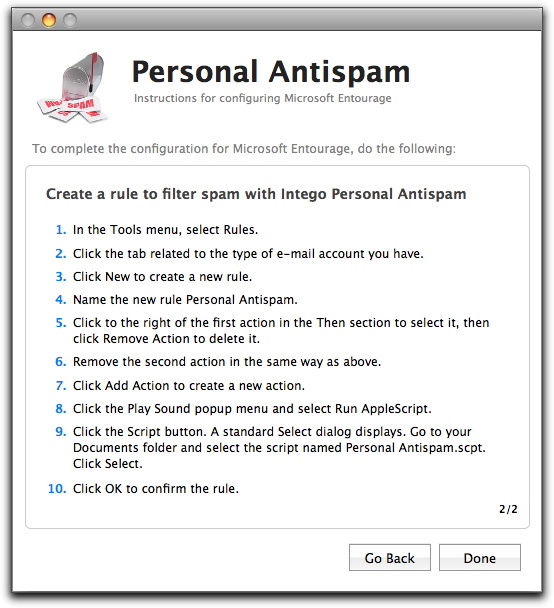 See Using Intego Personal Antispam to find out how to teach Personal Antispam to recognize your e-mail. Click Continue to go to the next screen. This tells you about the other types of filters that Personal Antispam uses to eliminate spam. This screen asks you to choose which e-mail program(s) you use: you can choose Apple Mail, the default e-mail program provided with Mac OS X, Microsoft Entourage or Outlook, the e-mail programs provided with different versions of Microsoft Office, or any combination of these programs, if you use more than one. Check the e-mail program(s) you use. You must select at least one of the programs. Click Go Back to return to any of the previous screens to make changes, or click Configure to configure Apple Mail for use with Personal Antispam and exit the assistant. Personal Antispam configures Apple Mail so it can filter incoming e-mail, then displays a dialog informing you that the configuration has been completed successfully. Click OK. The Personal Antispam Setup Assistant exits, and the main Personal Antispam window displays. You will have to perform some manual operations to configure Microsoft Entourage or Outlook for use with Personal Antispam. To help you configure Microsoft Entourage, an information panel will display in front of the Entourage window. Follow the instructions on this panel, and, when you have finished, click Done. 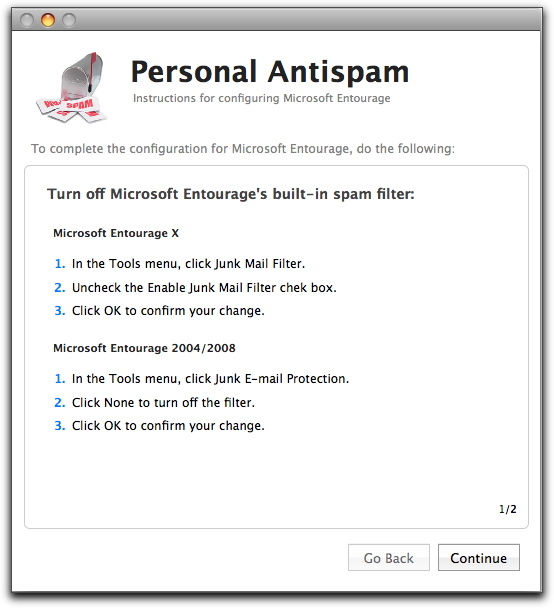 Click Go Back to return to any of the previous screens to make changes, or click Configure to open Microsoft Entourage and display the information panel, so you can finish configuring Personal Antispam. This screen remains in front of your Entourage window so you can see what steps you need to carry out. In the Tools menu, select Junk Mail Filter. 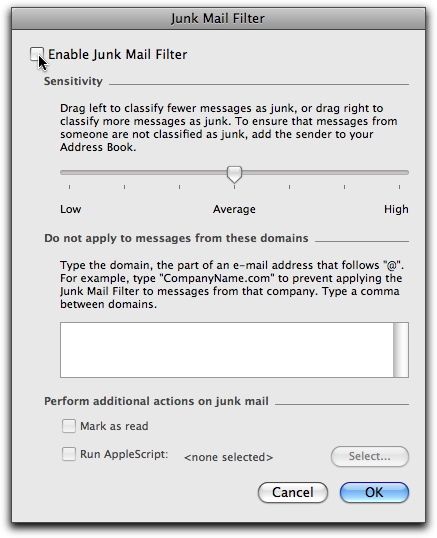 Uncheck the Enable Junk Mail Filter checkbox. 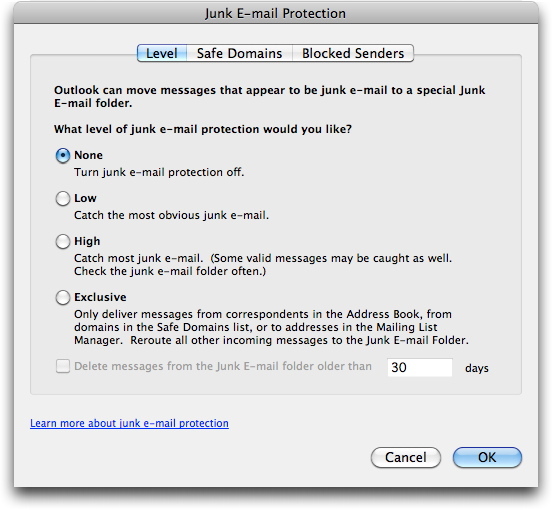 In the Tools menu, select Junk E-mail Protection. Click None to turn off the filter. When you have completed this, click Continue on the Personal Antispam information panel. 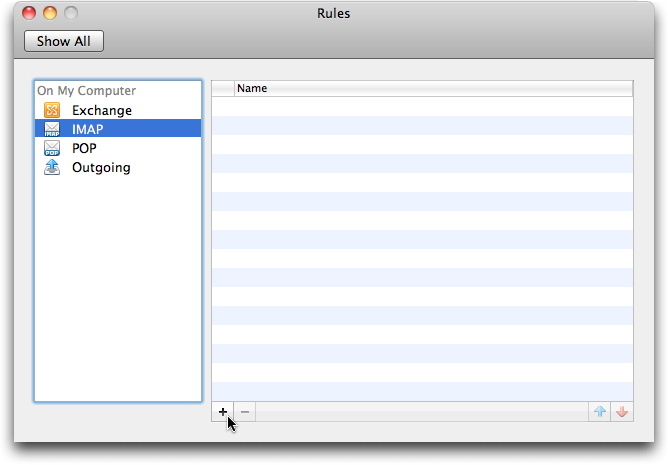 In the Tools menu, select Rules. Click the tab related to the type of e-mail account you have. In most cases, this is Mail (POP), which is a standard e-mail account. If you have an IMAP or Hotmail account, click the appropriate tab. If you have any doubts, ask your administrator or your ISP. Name the new rule Personal Antispam. Click to the right of the first action in the Then section to select it, then click Remove Action to delete it. Remove the second action in the same way as above. Click Add Action to create a new action. Click the first popup menu and select Run AppleScript. Click OK to confirm the rule. Note: If you have multiple e-mail accounts, and use more than one type of account (POP, IMAP, etc. ), you will need to create this rule once for each type of account so all your e-mail is filtered. When you have completed the above steps, click Done on the Personal Antispam information panel. Click OK, and the main Personal Antispam window displays. To help you configure Microsoft Outlook, an information panel will display in front of the Outlook window. Follow the instructions on this panel, and, when you have finished, click Done. 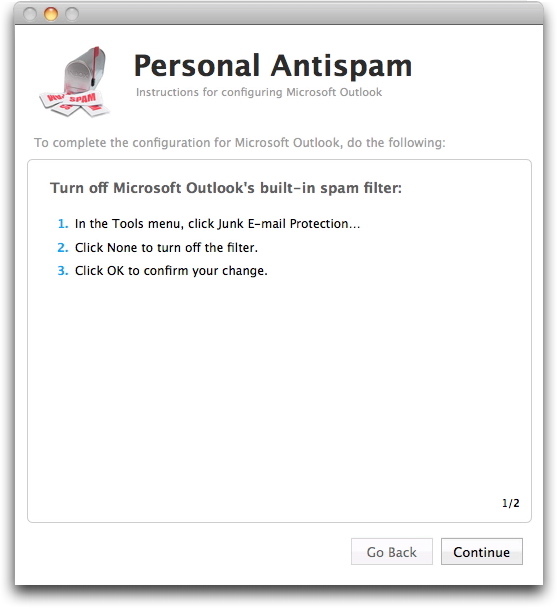 Click Go Back to return to any of the previous screens to make changes, or click Configure to open Microsoft Outlook and display the information panel, so you can finish configuring Personal Antispam. This screen remains in front of your Outlook window so you can see what steps you need to carry out. Click the type of e-mail account you have. In most cases, this is POP, which is a standard e-mail account. If you have an IMAP, or Exchange account, click the appropriate line. If you have any doubts, ask your administrator or your ISP. Click OK, and the Personal Antispam Assistant exits, and the main Personal Antispam window displays. 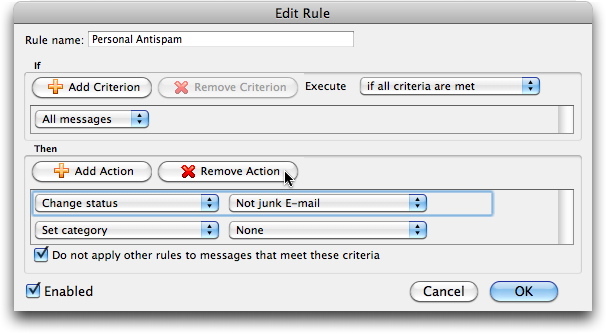 When Personal Antispam configures your e-mail program, it either creates a special rule (with Apple Mail) or instructs you to create one manually (with Microsoft Entourage or Outlook). 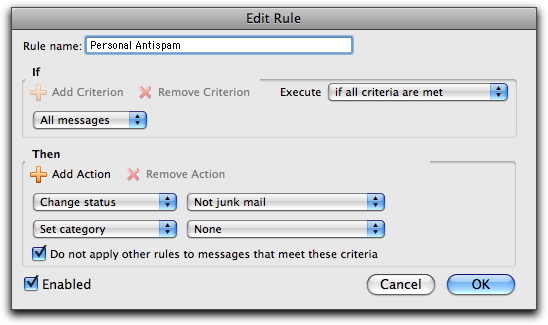 These rules tell the e-mail programs to activate Personal Antispam so the program can filter your incoming e-mail and check whether your messages are spam or legitimate e-mail. The position of this rule can make a difference - not in the efficiency of Personal Antispam's spam filter, but in the number of messages that are filtered and the statistics you see in displayed in Personal Antispam. If you place this rule at the end of the list (which is the default position), any other rules you may have set up will filter your messages before Personal Antispam gets to see them. These rules will filter some messages - in most cases, valid e-mail messages - and either move them into specific folders, change their categories, or perform other actions. 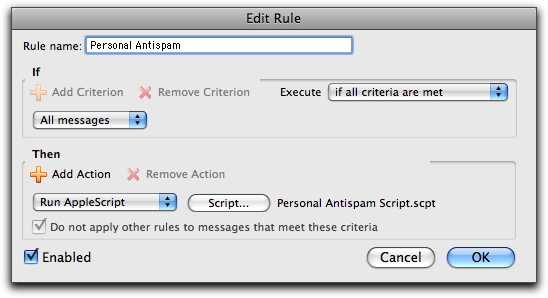 If the rules say that no further actions are not to be performed, Personal Antispam will have fewer messages to filter. If, however, you place the Personal Antispam rule at the beginning of your list of rules, all your messages will get filtered first by Personal Antispam, then by your specific rules. Again, this does not change the efficiency of Personal Antispam, but it will result in a higher number of messages being analyzed by Personal Antispam. 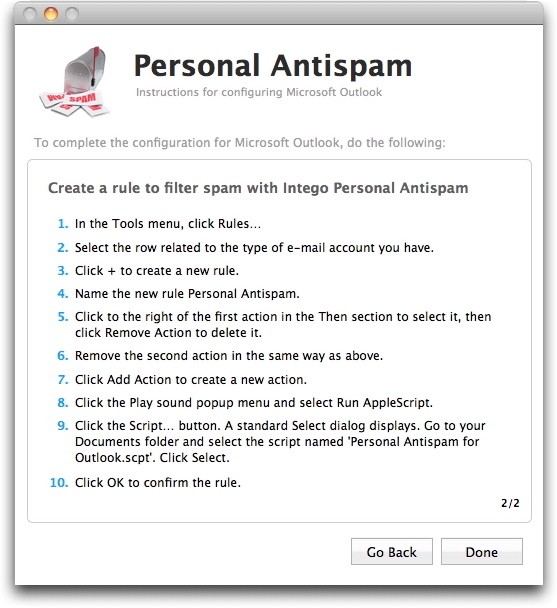 Note that if you use Microsoft Entourage or Outlook, and have mailing list information in the Mailing List Manager, these messages are sorted before any other rules, and will not be analyzed nor counted by Personal Antispam. You can use Personal Antispam with as many user accounts as you have on your Macintosh computer. However, since each user has different settings for their e-mail program, and may use a different program, you must configure Personal Antispam for each user who wishes to benefit from its functions. To do this, log out of the current account by selecting Log out [user name] in the Apple menu, then log in to a different user account. Launch Personal Antispam, which is located in the Applications folder, and the configuration assistant will open automatically. Follow the same procedure as that described earlier in this chapter to configure the user's e-mail program(s), and repeat this for all user accounts that will use Personal Antispam.